Age Restrictions: Children under 1 will not be admitted. 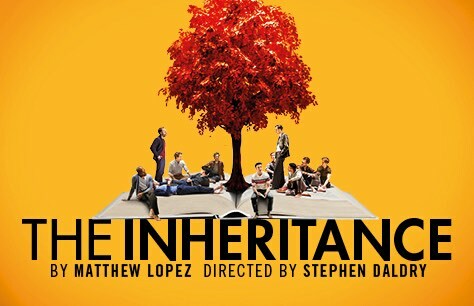 Following a sold-out, critically-acclaimed run at the Young Vic, Matthew Lopez’s major two-part world premiere The Inheritance lands in London's West End for just fifteen weeks. Directed by multi Olivier Award winner Stephen Daldry, this ‘monumental and transcendent' (Time Out) production questions how much we owe to those who lived and loved before us. A generation after the peak of the AIDS crisis, what is it like to be a young gay man in New York? How many words are there now for pain and for love? Stephen Daldry's ‘remarkably involving production’ (Independent) explores profound themes through the turbulent and often hilarious experiences of a group of young, ambitious New Yorkers. What is the legacy left to them by previous generations? What do they owe the future and each other? Spanning generations and interlinking lives, The Inheritance is ‘an exquisitely truthful and funny modern classic’ (Telegraph) that brilliantly transposes EM Forster’s novel ‘Howards End’ to 21st century New York. This show consists of 2 parts and is intended to be viewed sequentially. All persons aged under 16 must be accompanied and sat next to the accompanying adult. They may not sit on their own within the auditorium. If children do have separate seats, entry could be refused. All patrons, regardless of age, must present a valid ticket to gain entry to the theatre. Please ensure that any children or infants for whom you are responsible also have a valid ticket. Your child should be able to sit unaided within the purchased seat. We do not allow children to be seated on an adult’s lap or babes in arms.